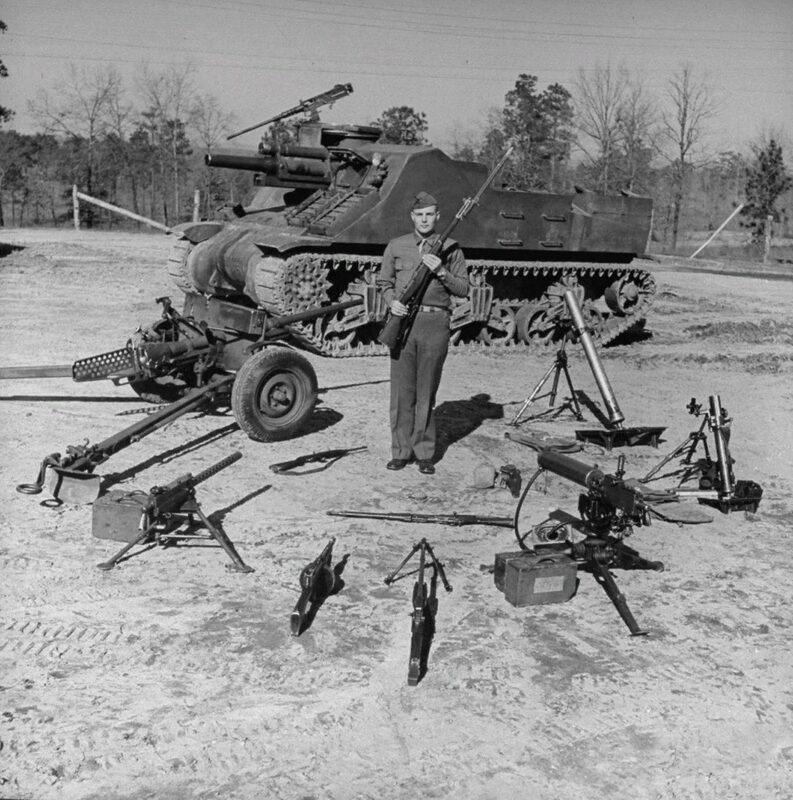 The American soldier demonstrates various weapons of the US Army. 1. 1. 105mm Howitzer Motor Carriage M77. On the turret – 12.7-mm (50-caliber) machine gun “Browning” M2HB. 2. 37-mm anti-tank gun M3. 3. 7.62-mm (30th caliber) heavy machine gun “Browning” M1919A4. 4. Submachine gun Thompson M1928A1. 5. Automatic rifle Browning M1918A2 (BAR). 6. “Browning” M1917A1. Like the M1919, the machine gun of 7.62 mm caliber. 7. 60 mm mortar M2. 8. 81 mm mortar M1. In the inner circle – self-loading carbine M1, rifle Springfield M1903 and pistol Colt M1911 A1; in the hands of a soldier – self-loading rifle Garand M1.